As seen in the above picture, the Palestinian Authority ignored Netanyahu’s request. 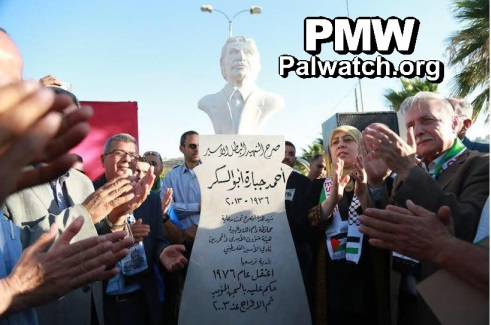 Palestinian Media Watch exposed the PA's plans on July 13. Ahmad Jabarah Abu Sukkar (“Abu Sukkar”) - planned a bombing attack in 1975 in which a refrigerator filled with explosives was detonated in Jerusalem. 15 people were killed and over 60 people were wounded. He was sentenced to life in prison plus 30 years, but was released from prison after 28 years as part of a goodwill gesture from Israel to the PA in 2003. He was a member of the Fatah Revolutionary Council and an advisor to Arafat on prisoners' affairs. He died of a heart attack in 2013 in the PA.